At the Energy and Environment Cabinet (EEC), the Kentucky Division of Water’s (KDOW), mission is to manage and protect our state’s most precious natural resource, water. And division employees are doing it with a new tool, Geographic Information Systems, or GIS. GIS lets anyone visualize, question, analyze, and interpret data to understand relationships, patterns and trends. Through the use of GIS, employees at the KDOW are placing valuable information onto web pages where they can be accessed by the public. One such place, called the Water Maps Portal, provides users information about water health, flood risk and watersheds, as well as updated information on topics ranging from droughts to harmful algal blooms. It also gives users the ability to explore the waters of the Commonwealth through story maps. The Water Maps Portal originated from a growing need for a user friendly interface to provide information about the waters of the Commonwealth to a variety of stakeholders. The idea of a portal sprang from the development of an online map that could show whether or not a house was located in a floodplain. Soon after, the Kentucky Legislature passed a law requiring EEC to list on its website the waters in Kentucky that were not meeting their designated use – such as swimming or boating. It was clear to the KDOW that information about the quality of the waters of Kentucky would be much easier to display, access and understand on a map and GIS was the key to producing it. The Cabinet plans to continue to add to the portal as the demand grows for information about Kentucky waters. To date, the Cabinet’s GIS work on this portal has received two awards and was recently nominated for a third. 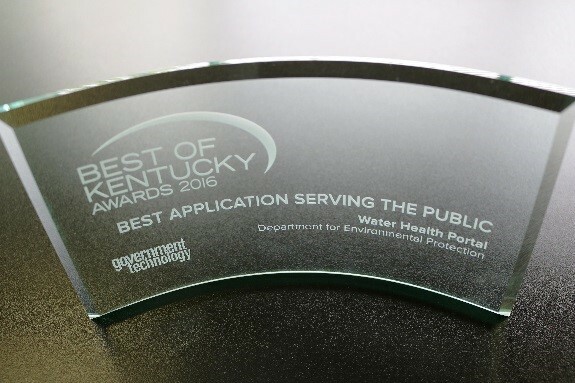 On April 19th 2016, at the Kentucky Digital Summit in Frankfort, the Kentucky Department for Environmental Protection, in conjunction with the KDOW, received the 2016 Best of Kentucky, “Best Application Serving the Public,” for the Water Health Portal application, which is one of eight applications found on the Water Maps Portal. In the spring of 2017, the Water Maps Portal was selected by Jack Dangermond, president of Esri, a GIS software and technology company located in Redlands, California, to receive a Special Achievement in GIS. This award is given to user sites around the world to recognize outstanding work with GIS technology. While this portal and its individual applications have been honored with awards, it is the daily use of these applications by the public, cabinet staff, and stakeholders throughout the state and the country that will define its success. Whether it is your favorite little swimming hole or the mighty Ohio River, the Water Maps Portal brings information that matters to users’ fingertips. Check-it out for yourself at www.watermaps.ky.gov, and explore more of what Kentucky has to offer.